Marymond products are becoming very popular among people in their twenties. In 2015, this company started to gain recognition when Suzy (a famous Korean star) was photographed holding a Marymond phone case at the airport. The real beauty of Marymond products does not merely lie in their design, but also in the meaning that each design holds. Marymond products are designed with patterns to represent the stories of the “comfort women”. The company also donates a portion of their income to the “comfort woman” cause. Q. I’ve heard that Marymond was established based on experiences you had when you were in a university club. Could you elaborate on how exactly those experiences helped you? A. When I was discharged from the army, I joined a club called ‘Enactus’, which is basically led by students who are interested in community problems. Many different universities have ‘Enactus’ clubs, so it is a huge network. There, I got the chance to meet the grandmothers who were “comfort women” during the Japanese colonial time, and listened to their stories at the Gwangju Sharing House. The more I listened to their stories, the more interested I became. Q. Then, what was the motivation for you to turn that interest into a business? A. Before graduating from university, I had to decide whether to find an employment or to challenge myself to do other things. I thought that I would regret my decision if I entered a company. 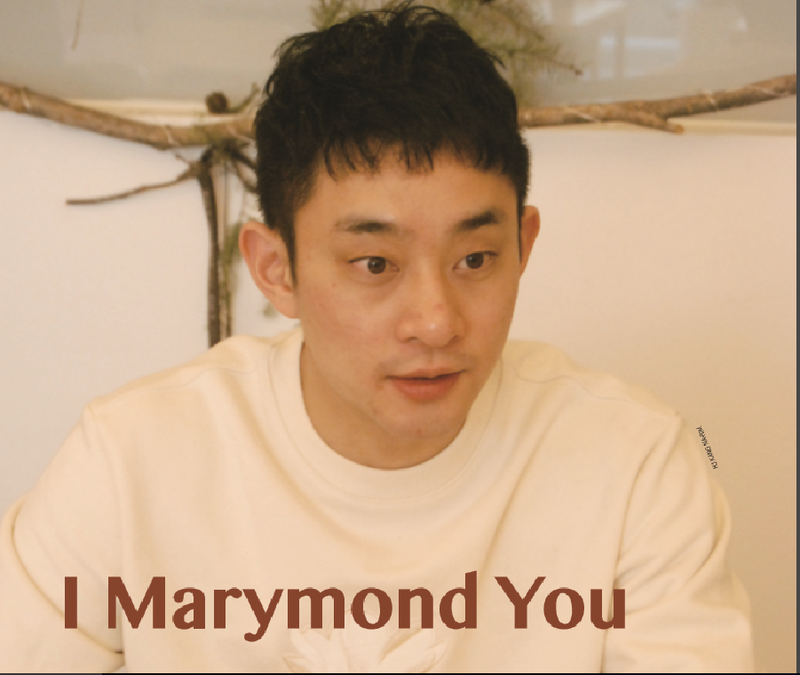 Therefore, I decided to establish Marymond. However, there were many troubles and difficulties at first because I hadn’t expected or planned to ever start a company. Q. What difficulties did you encounter when you first started the company, and how did you overcome those problems? A. Financial difficulties frequently arose. Plus, since we didn’t have any design major colleagues, it was hard to create a design that perfectly associates with the images of many “comfort women”. Also, no one in our team really had the ability to skillfully communicate with cooperative firms or related NGOs. To overcome these problems, I tried to remain focused on what I was doing and I tried not to stray from my initial intention. Q. The name Marymond is made up of two words: “mariposa,” which means butterfly in Latin, and “almond” from the painting Almond Blossom by Vincent van Gogh. Why did you decide to combine the two words? What does it mean? A. During the brand renewal, we had to answer questions about the values that our company had and the reason why we decided to uphold these values. During the consulting process, the keywords, ‘Mariposa’ and ‘Almond Blossom’, were magnified among the various answers. Especially the art director suggested we use the idea of Almond Blossom painting in naming our brand. That is how we chose the name. We decided to present “comfort womenˮ as flowers that haven’t bloomed yet. We hoped that the butterfly could help the flowers to bloom. Q. Could you tell us more about the Human Branding Flower Grandmother Project? A. Before we begin preparing for the season, we spend about a month trying to understand the stories of the “comfort women”. During this month, we search for references and testimonies and read them carefully. Through research, we try to find out as much as possible about their lives and their inherent values. If we get to have an opportunity to meet them in person, we engage in conversation to better understand the feelings and emotions we learned about in our research. We choose keywords and characteristics and select flowers based on these keywords. We recently met Lee Soon-duk, whose story inspired us to choose the camellia as Febuary flower. Q. What has been the most impressive incident you can recall from your conversations with them? A. When we go to the shelters, we usually meet the “comfort women” and try to engage in conversation. They always welcome us with open arms and words of blessing. Once, grandmother Gil Won-oak sang for us. She was really good at singing and we were all impressed. In March, the movie The Apology will be released. The movie is about three grandmothers: Gil Wonoak from Korea, Chao from China, and Adella from the Philippines. In the movie, you can also hear her singing. It would be great for many students to see that movie. Q. Marymond has implemented a lot of programs such as the “Selfd is covery S ch o ol p ro ject” , the “Together project”, and the “Parents growing School project”. Can you briefly explain these programs and the intentions of these programs? A . The fundamental mission of Marymond is to uphold the dignity of people living in this era. Those projects are based on that very mission. Grandmother Gil Won-oak said, “The kids should live in a peaceful world.” With her idea in mind, we planned various programs. By providing various programs, we could encourage the customers to actively participate in a variety of activities. Q. Every project is based on the concept of “regaining dignity.” What do you think is the most important attitude in regaining one’s dignity? A. To perceive and confidently believe that one’s presence itself is valuable is important. After you grasp and believe this, you will be able to appreciate the value of others too. It is important to have relationships based on this attitude. Q. We heard that Marymond chose to cooperate with Dohands Company, which is famous for employing the homeless. Why did you choose to work with Dohands Company? A. The representative of Dohands Company is a good friend of mine; we met when we were both in ‘Enactus’. We depend on each other and we often work out together these days. After Suzy’s photo went viral, we had so many orders to deliver that even the designers had to participate in the delivery process. To solve this problem, we approached Dohands Company. We devised a plan to give the shipping expenses to the workers, so that both companies could benefit from the collaboration. Since then, we have frequently worked together. Q. What, do you think, are the factors that contributed to Marymond becoming such a big company? A. We don’t view ourselves as a big company. It is true that we’ve come a long way, but there’s still more to achieve. The reason we have made it as far as we have now is because of our genuineness. We always try our best to maintain genuine relationships with our partners, customers, and colleagues. It is true that we can’t always reflect what the customer wants, but we do our best to think about their needs and demands. Q. We have heard that you were planning to work with foreign women and mother figures. Do you have any plans to work with men and father figures? A. Of course. We don’t intentionally choose to work with women only. The reason why we chose to work with the grandmothers is not only due to diplomatic issues between Japan and Korea, but also because their case is closely related to the upholding of human rights. We are ready to work with anyone whose human rights have been violated. For example, we’re planning to expand our business to the Greater China Region this year. We’re developing mobile and online pages so that people in the Greater China Region can purchase our products. Q. Do you have any advice for students who plan to start their own business? A. Based on my experience, it is important to consider how my business can positively affect the society. If you are looking for money or social status, those can later work as the factors that make you give up the business when it doesn’t go as you planned. Q. Finally, what would you like to say to university students? A. On every International Women’s Day, we hold a marathon at Seoul City Hall to remember the “comfort women”. The participants will wear T-shirts made by Marymond and run for about 10 kilometers. The marathon will be held on March 18, so I hope that many students will participate and spend meaningful time with us. Lastly, we always appreciate your attention and we’ll do our best never to lose our authenticity and provide qualified and meaningful products. Thank you.